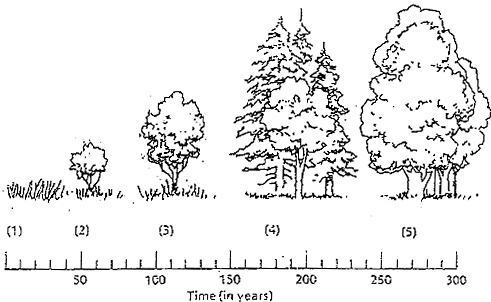 Succession, a series of environmental changes, occurs in all ecosystems. The stages that any ecosystem passes through are predictable. In this activity, you will place the stages of succession of two ecosystems into sequence. You will also describe changes in an ecosystem and make predictions about changes that will take place from one stage of succession to another. The evolution of a body of water from a lake to a marsh can last for thousands of years. The process cannot be observed directly. Instead, a method can be used to find the links of sttages and then to put them together to develop a complete story. The water level of Lake Michiga was once 18 meters higher than it is today. As the water level fell, land was exposed. Many small lakes or ponds were left behind where there were depressions in the land. Below are illustrations and descriptions of four ponds as they exist today. Use the illustrations and descriptions to answer the questions about the ponds. Pond A: Cattails, bulrishes, and water lilies grow in the pond. These plants have their roots in the bottom of the pond, but they can reach above the surface of the water. This pond is an ideal habitat for the animals that must climb to the surface for oxygen. Aquatic insect larvae are abundant. They serve as food for larger insects, which in turn are food for crayfish, frogs, salamanders, and turtles. Pond B: Plankton growth is rich enough to support animals that entered when the pond was connected to the lake. Fish make nests on the sandy bottom. Mussels crawl over the bottom. Pond C: Decayed bodies of plants and animals form a layer of humus over the bottom of the pond. Chara, a branching green algae, covers the humus. Fish that build nests on the bare bottom have been replaced by those that lay their eggs on the Chara. Pond D: The pond is so filled with vegetation that there are no longer any large areas of open water. Instead, the pond is filled with grasses. The water dries up during the summer months. The climax community in the area of Michigan is a beech-maple forest. After the ponds are filled in, the area will undergo another series of stages of succession. This is illustrated below. Briefly explain what is happening in the diagram.